See the difference. Sense it, too. When it comes to your vision, nothing is too good. 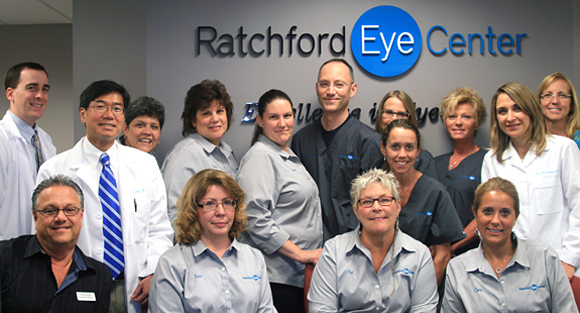 That’s why, at Ratchford Eye Center; we overlook nothing to provide you with the best of everything. That includes giving you the respect and courtesy you deserve, as well as the flexible appointment hours your busy life demands. With both the latest in high technology and a highly trained staff, we’re one of Connecticut’s most comprehensive eye treatment centers. But the reason so many patients refer their family members to us is because we treat each patient like family. We have all the latest technology, but what makes us so exceptionally well-equipped to care for your eyes are our doctors. The Ratchford Eye Center is happy to introduce a new member of the Ratchford family and workplace, Christine Louise Napoletano, O.D. ! Mary Gina Ratchford, M.D. came to the Berlin area in 1999 after practicing in Springfield, MA for 5 years. Originally, Dr. Ratchford worked with Robert Cosentino, M.D. before taking over his practice in 2002. As the practice grew, Dr. Ratchford sought to relocate to a space suited to her practice and to bring in a colleague who shared her philosophy of treating each patient as if he or she were a family member. After a careful search the practice reopened as The Ratchford Eye Center, LLC, with the addition of Dan Chin, M.D. With these two physicians the practice was able to serve its patients more fully. Ultimately, out of a desire to establish a practice that could meet the needs of each patient, the new facility on Farmington Avenue was built. The practice brought Dr. Brett Kjellen, O.D., and most recently, Christina Louise Napoletano, O.D., on board and opened a full-service optical shop.